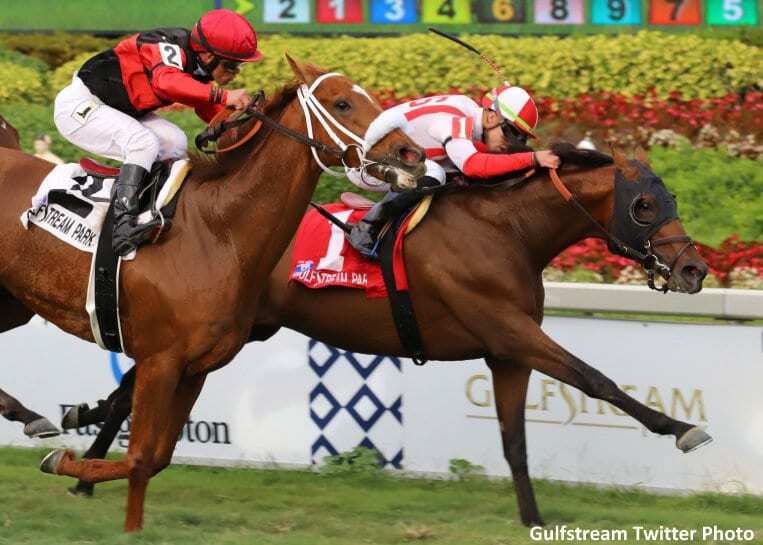 Klaravich Stables and William H. Lawrence's Focus Group, favored in his seasonal debut off a 24-week break between races, surged up the rail and got his nose down on the wire ahead of long shot Melmich to capture Saturday's $250,000 Pan American (G2) at Gulfstream Park. The 58th running of the Pan American for 4-year-olds and up on the turf was the sixth of seven stakes, four graded, worth $2.15 million in purses on a blockbuster 14-race $1 million Xpressbet.com Florida Derby (G1) Day program. Focus Group ($5.80) ran 1 ½ miles in 2:30.03 over a firm turf course to earn his second career stakes win and first in graded company. It was the fourth win of the afternoon for Championship Meet-leading rider Irad Ortiz Jr. and third in a stakes, following his sweep of the $125,000 turf stakes for 3-year-olds with Seismic Wave in the Cutler Bay and Trenchtown Cat in the Sanibel Island, the latter for fillies. Winner of the John's Call Stakes last summer at Saratoga, Focus Group had not raced since rallying to be third in the Canadian International (G1) Oct. 23 at Woodbine. He prepped for his return with eight timed works since early February at Palm Meadows, Gulfstream's satellite training facility in Palm Beach County. Village King, trying to give trainer Todd Pletcher his second straight Pan American win and fourth overall, was unhurried setting a measured pace of 24.93 seconds for the first quarter-mile, followed by splits of 51.62 and 1:18.37, tracked by 40-1 long shot Salute the Colonel. Focus Group settled along the inside in mid-pack with Melmich racing well back. Canessar moved up from a stalking spot to launch his bid outside of Village King as the field made their second turn into the stretch. Ortiz kept Focus Group busy inside and set his sights on the leader in mid-stretch as Melmich and jockey Javier Castellano were winding up his run on the far outside. The two horses passed Village King in the final sixteenth and rushed to the wire, with Focus Group winning the head bob. This entry was posted in Racing and tagged Chad Brown, focus group, Gulfstream, gulfstream park, Horse Racing, Irad Ortiz, Klaravich Stables, melmich, palm meadows, pan american, willaim lawrence by Press Release. Bookmark the permalink.